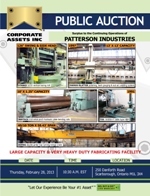 Corporate Assets Inc. | Patterson Industries - Corporate Assets Inc.
LARGE CAPACITY & VERY HEAVY DUTY FABRICATING FACILITY FEATURING: STANKO IL532 10' vertical boring mill, FARROS BLATTER (1997) SB 500E combination external back gouging and welding system for pressure vessel heads, ESAB (2004) ACER2 VISPC CNC precision plasma cutting system, PEARSON 200 ton X 16' hydraulic press brake, BERTSCH #18 10' X 1.25"initial pinch hydraulic plate bending rolls, BERTCH 96" X .5" initial pinch mechanical power bending rolls, BUFFALO 4" X 4" X .625 angle bending rolls, HACO (1992) 10' X .5" hydraulic shear, PANDJIRIS 10X8 welding manipulator with LINCOLN automatic welding system, BERNARD 18' X 24' welding manipulator with MAC automatic welding system, TRUMPF 80 hydraulic punch, IRCO tank turning rolls up to 75 ton cap., ARONSON 2500 lbs. welding positioned, ASQUITH NCR 4A8 CNC radial arm drill, ASQUITH POWERTHRUST 6PT 23-108 8' radial arm drill, GWM Z3080X25 8'radial arm drill, TOS (1991) W100A 4" table type horizontal boring mill, NILES 132" X 36' engine lathe, STANKO 56" X 16'engine lathe, VDF 28"/37" X 132" gap bed engine lathe, HWACHEON 15"/ 25" X 76"gap bed engine lathe, DEAN SMITH & GRACE 20.5"/ 30.5" X 80"gap bed engine lathe, (24) MIG, TIG & stick welders, welding accessories, DEMAG 40 ton, 58.43' double bridge crane with 10 ton auxiliary hoist, SHAW BOX 25 ton 58.43' cab operated, double girder bridge crane with 15 ton auxiliary hoist, MUNK 10 ton 58.43'single girder, bridge crane, TAYLOR YARDMASTER Y-18 WE 18000 lbs, forklift, CATERPILLAR GP25 5000 lbs. LPG forklift, CLARK GCS30M8 5350 lbs. LPG forklift, CLARK C-500-H35 3500 lbs. LPG forklift, (15) jib cranes up to 2 ton cap, STEEL INVENTORY including heavy steel plate, I beam, angles, channel & tube, remnants, etc. Also: tool cabinets, mag drills, RIDGID pipe threaders & dies, double end pedestal & bench grinders, drill presses, belt sanders, pump trucks, angle plates, lifting accessories, drills, power tools, hand tools, machine accessories and much much more!